Welcome. It is our goal to provide you, the citizens of Bridgeville with information you need to make you more familiar with your city and the services provided by us. Bridgeville is one of the oldest surviving communities in western Sussex County. Long before Sussex County was subdivided into hundreds, a community in the 1680′s began to develop along the small waterway known as Bridge Branch. A bridge was built across the stream and it served as the nucleus of the community. 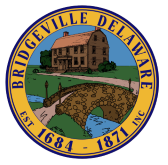 The name Bridgeville was adopted around 1810 and the Town was incorporated in 1871. Today, Bridgeville is a pleasant agricultural-oriented community known for fine homes and broad tree-lined streets. Many diverse denominations are represented by the Churches of Bridgeville.